Nielsen's core orchestral achievement all in a single convenient box. I can only accept that the black and amber design does not shout 'buy' at you but BIS has always preoccupied itself with musical values first and foremost. In fact, if you remember them, the company�s LPs shared the same sombre design speaking of a quiet confidence in their products' musical merits. Is that confidence well placed in this case? Emphatically, yes! Myung-Whun Chung's version of the Third has to be among the best in the catalogue. His sense of thrust and momentum, rhythmic craft and accent is phenomenal. When you couple this with a recording that deserves a place in the Hall of Fame you have a winning combination. This is simply glorious music-making with the brass given their unblushing place centre-stage. Tender moments are not lost either - listen for example to the lissom Rimskian rocking and lilting at 2.23 in the final movement - an Antar influence or what? Similar strengths radiate from Chung's version of the First, Second (the same blaze of energy, the same coarsely blown brassy glories and the same perfect recording quality) and Fifth though the latter is not quite as overwhelming as the Third. The Järvi disc takes us into the more 'modernistic' phase of Nielsen's symphonies. In fact Järvi recorded all six for DG but, as yet, I have not heard them. I wonder if Chung felt attracted to these works. While not losing sight of or grip on the tumult and blaze of the Fourth Symphony (shades of Vivaldi's Winter at the start of the Fourth movement and of Sibelius's Lemminkainen's Return) Järvi's Fourth is specially memorable for its flowingly coloured pastoralism. The Sixth remains enigmatic despite a lucidly detailed recording which makes the most of the work's other-worldly pointillism. Järvi is very good at putting across the work's humour. However my first recommendation for this work has to be Ormandy on SONY. All four discs feature the Gothenburg Symphony (Göteborgs Symfoniker).Three of the four contain works (concertos and symphonies 1-3, 5) directed by Myung-Whun Chung and the fourth has symphonies 4 and 6 conducted by Neeme Järvi. Bis must have been frustrated at not being able to hold Myung-Whun Chung to finishing the cycle. From this viewpoint the BIS cycle resembles the SONY with conductorial duties split between two conductors (Järvi/Chung as against Ormandy/Bernstein). The concertos are strong contenders in a field less crowded than that for the symphonies. Dong-Suk Kang's fluent and fluid power is memorable. I heard his Naxos version of the Elgar Violin Concerto recently and this is of similar exalted quality though not on quite the same plane as Sammons, Bean or Heifetz. The Flute Concerto in which the rowdy upstart flute of Patrick Gallois slugs it out with the rude and obstreperous trombone takes pride of place on the concerto disc. The Clarinet Concerto (Ole Schill) is also given an excellent outing though its charms as a work are more sphinx-like than the Flute Concerto. The competition for this box is indirect. Where else will you find a coupling like this? You won't. You are getting the complete symphonies on three CDs and the complete concertos on another. Going back to LP days and 1974-75, EMI Classics issued the DRSO/Herbert Blomstedt series in one whopping box but even that was fleshed out with a beneficent cloud of smaller orchestral Nielseniana. The closest approximation is a SONY Classics box of the CBS Nielsen symphony cycle (Ormandy and Bernstein) with the clarinet and flute concertos (Drucker/Baker), no violin concerto and a small flock of slighter or at least shorter pieces. That box is now deleted and in its place the wind concertos have just come out on one SONY Essential Classics CD and those symphonies in a bargain price box - recommendable with an extreme Bernstein 3 and the most lucid account I have ever heard of No. 6 (Ormandy). Set against this the 1960s analogue vintage of these CBS recordings. Blomstedt/SFSO (not heard by me but very highly thought of generally) are still at full price. The recent Dacapo Schønwandt box of the complete symphonies is extremely good and the tangiest analogue recordings of the Symphonies (LSO/Ole Schmidt) are still there in a bargain priced set from Regis. Timorous souls might like to note that most reviewers have criticised those Unicorn derived tapes (c 1974 and for many a year matched up against Blomstedt's Danish RSO series on EMI) for their orchestral rough edges. Personally I find them irresistible still. BMG intermittently offer the Berglund Royal Danish Orchestra cycle at bargain price. I have a lot of time for Berglund (his Bournemouth Fifth on EMI is every bit as strong as his EMI recordings of the Fourth and Sixth Symphonies of Vaughan Williams) but I have not yet been able to hear that set and other reviewers have urged caution. Danacord's historic recordings cycles include a box of all six symphonies variously conducted by Tuxen, Jensen and others. I would like to review that set at some point but with its archival mono sound quality it is sui generis and not to be compared with the BIS set. It is part of the critic's currency always to caution against complete recordings of a symphonic cycle by one conductor with one orchestra. Well while it certainly was not planned, this set places Chung alongside Järvi and gives that variety. On price you will need to shop around but the set is catalogue-priced at four CDs for the price of three. The older Blomstedt is spread across various midprice EMIs and numbers 5 and 6 are missing from the catalogue at present. 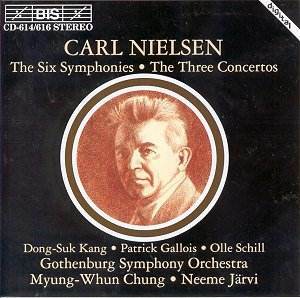 You cannot go far wrong with most of the complete Nielsen symphony recordings on the market. This one however has great versions of the Second and Third Symphonies in which the impetuous power of the life force drives belligerently forward. The others appear in excellent readings. The Gothenburg Orchestra should use this set as calling card. It portrays them in a light that places them in the same columned pantheon in which we find the Philadelphia, the Leningrad (in Mravinsky's day) and the Philharmonia in Boult's studio time with them in the early-mid 1970s. This outstanding set is something of a 'sleeper' having been around for at least a decade. If you have your doubts then sample the Third Symphony and the Flute Concerto. All in all: musicmaking that is rapturously airborne, lyrically triumphant, and uproarious.